The release of formal restrictions on the free movement of Central and Eastern Europeans that started with the end of the Cold War and the eastward enlargement of the European Union in the 2000s have led to new migration flows in Europe. Not surprisingly, the number of surveys carried out among migrants from former communist countries has increased significantly in recent years. 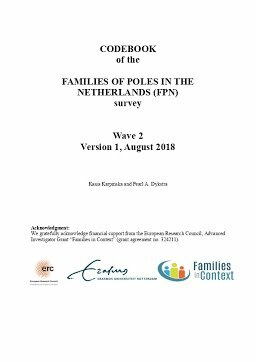 These surveys, however, tend to focus on topics such as migration and job history, structural and socio-cultural integration in the host country, bonds with the country of origin or family formation and intermarriage. Insofar exchanges with family members are addressed, they tend to be about remittances to and frequency of contact with “the” family in the country that stayed behind. Information about migrants from Central and Eastern Europe regarding exchanges of money, practical support, emotional support with individual family members, background information on the family of origin, espoused family obligations, and marital and parenthood histories and well-being is scarce. The FPN survey was carried out to fill that void. In absolute terms, Poles are the largest group amongst emigrants from the Central and Eastern European countries which accessed the European Union in 2004. Estimates suggest that between 2004 and 2007, at least one million people emigrated from Poland. Among the top destination countries of Poles in Europe are Great Britain, Germany and the Netherlands. In the Netherlands, the annual number of Polish migrants currently entering the country is greater than the number of traditional migrant groups (Turks, Moroccans, Antilleans and Surinamese) taken together. There are more than 160,000 Poles in the Netherlands according to Statistics Netherlands.